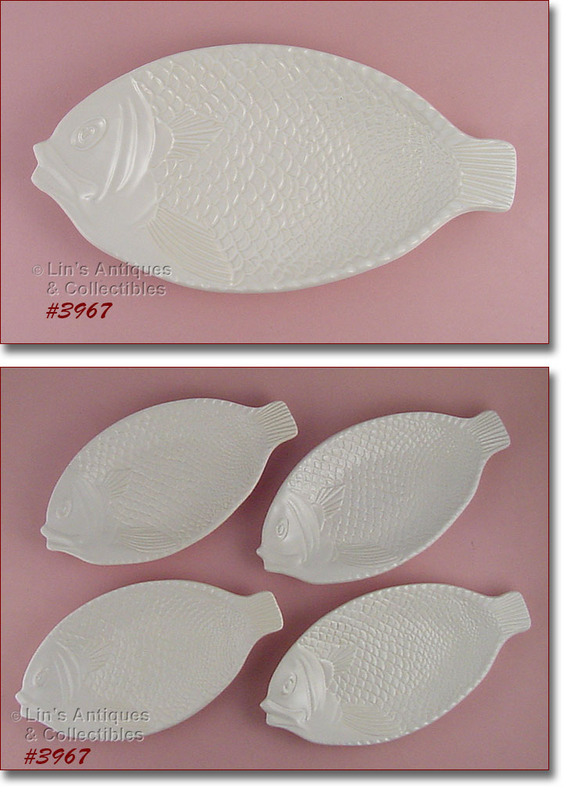 THIS LISTING HAS A SET OF 4 McCOY FISH SHAPED PLATES! THEY MEASURE 12 1/8” LONG (AT LONGEST), 6 ¼” WIDE (AT CENTER), AND BACKS ARE MARKED: OVENPROOF, 9374, USA. EXCELLENT CONDITION! NEAT TIKI GLASS IN THIS LISTING! MEASURES 5” TALL AND CAN BE USED AS INTENDED, AS A VASE, OR MY FAVORITE – A PENCIL HOLDER! EXCELLENT CONDITION – NO CHIPS, DINGS, ETC. THIS LISTING HAS AN EXCELLENT CONDITION MCCOY CEREAL BOWL! IT’S PINK WITH “SPECKLES”, MEASURES 5 5/8” DIAMETER, 2 1/8” TALL, AND BOTTOM IS MARKED MCCOY, USA. BOWL LOOKS NEW AND UNUSED! ALTHOUGH THIS LITTLE BOWL HAS SOME PRODUCTION FLAWS, I DIDN’T HESITATE TO PURCHASE BECAUSE IT IS A DIFFICULT TO FIND ITEM! BOWL MEASURES 4 5/8” DIAMETER, 3” TALL, AND IS UNMARKED. THE ONLY “USE” EVIDENCE IS A TEENY DING ON ONE OF THE “RIBS” AND ANOTHER ON THE RIM. AS NOTED, IT HAS PRODUCTION MCFLAWS – FIRED-ON FLAKES INSIDE BOTTOM (NO COLOR BUT RECEIVED CLEAR OVER-GLAZE) AND A COUPLE PIN-POPS. 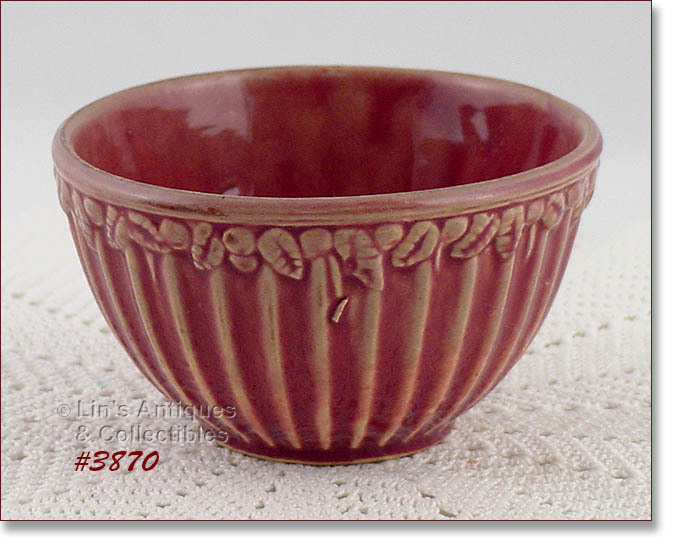 THIS IS A REALLY NEAT BOWL, A GREAT ADDITION TO A COLLECTION AND NICELY PRICED! THIS LISTING HAS A 3 PIECE CHILDREN’S DISH SET FROM MCCOY’S WABBIT COLLECTION! THERE’S A CUP, A BOWL, AND A SAUCER. BOTTOMS ARE MARKED: 1221 (1222, 1223), MCCOY, LANCASTER COLONY (MARK), USA. SET IS IN SUPER CONDITION WITH SOME TYPICAL MCFLAWS (GLAZE SKIPS, FEW DARK SPECKS, ETC.) – NOTHING DETRIMENTAL! 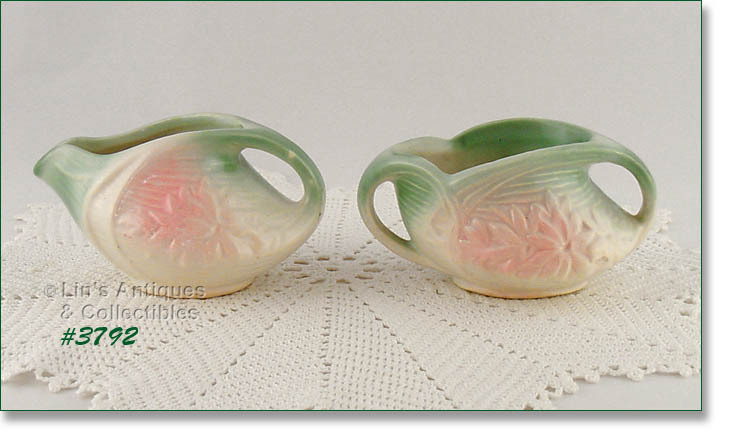 THIS LISTING HAS SOME MORE NEAT MCCOY BOWLS IN THE “RINGS” DESIGN! THERE IS A SMALL BLUE COLOR WITH “SPECKLES”, A SMALL PINK COLOR, AND A LARGER YELLOW COLOR WITH “SPECKLES”. THE BLUE AND PINK BOWLS ARE THE SAME SIZE (2 ¾” TALL, 4 ¾” DIAMETER) AND ARE PERFECT FOR CEREAL, ICE CREAM, OR LEFTOVERS. THE YELLOW BOWL IS A LITTLE LARGER AT 3 ½” TALL AND 6” DIAMETER. ALL BOWLS ARE MARKED MCCOY, USA, OVEN PROOF AND ARE IN EXCELLENT CONDITION. BLUE AND PINK BOWLS ARE $22 EACH, YELLOW BOWL IS $24. THERE ARE 4 MCCOY NESTED BOWLS IN THIS LISTING! I REFER TO THE DESIGN AS RINGS. THE SMALLEST BOWL IS A PRETTY BEIGE COLOR WITH LOTS OF LITTLE “SPECKLES”, MEASURES 2 ¾” TALL AND 5” DIAMETER. 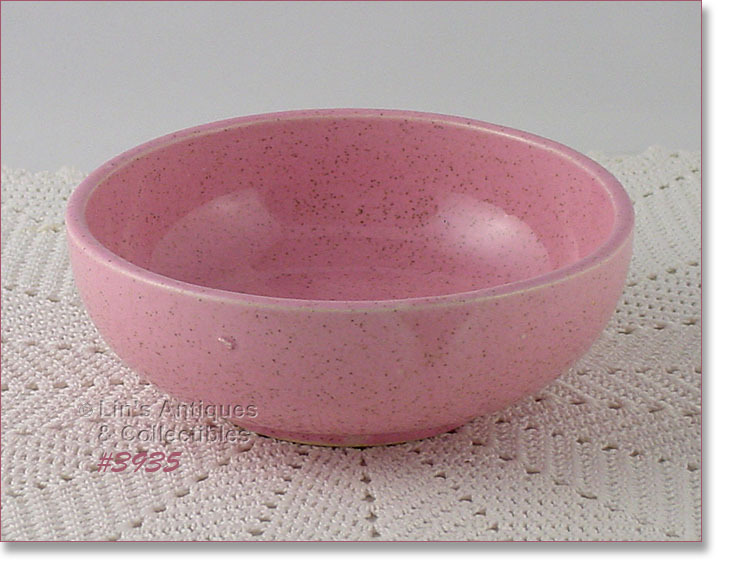 NEXT SIZE BOWL IS A PRETTY PINK COLOR, MEASURES 3 ¼” TALL AND 6” DIAMETER. NEXT ONE IS A PRETTY YELLOW COLOR, 3 ¾” TALL AND 7” DIAMETER. LARGEST BOWL IS BLUE WITH LOTS OF LITTLE “SPECKLES”, MEASURES 4 ¾” TALL AND 8” DIAMETER. ALL ARE MARKED MCCOY, USA, OVEN PROOF AND ARE IN SUPER CONDITION WITH NO CHIPS, DINGS, OR CRACKS. THERE IS SOME MINOR CRAZING ON THE BLUE BOWL – THAT’S IT! THESE BOWLS ARE FROM MY EXTENSIVE COLLECTION AND HAVE BEEN DISPLAY ONLY. ANOTHER EXCELLENT CONDITION McCOY HAPPY FACE CUP! BOTTOM IS MARKED McCOY (IN CIRCLE WITH LINES), USA. LOOKS NEW AND UNUSED – SUPER! 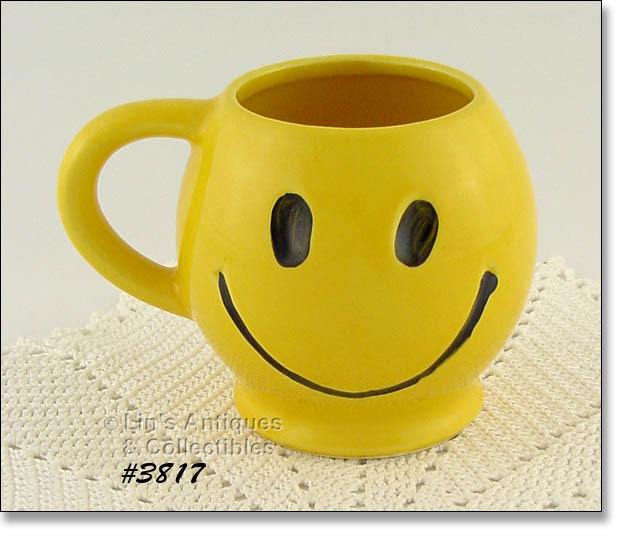 EXCELLENT CONDITION McCOY SMILE (HAPPY) FACE MUG! BOTTOM IS MARKED McCOY (IN CIRCLE WITH LINES), USA. CUP LOOKS NEW AND UNUSED! THIS MCCOY LISTING HAS A CREAMER AND OPEN SUGAR IN LOVELY PASTEL COLORS! THE DESIGN IS DAISIES AND THEY’RE A SOFT PINK COLOR ACCENTED/TRIMMED IN A BEAUTIFUL SEA-FOAM GREEN COLOR. THE COLORS ON THIS SET ARE EXCEPTIONAL! BOTH PIECES ARE MARKED MCCOY AND ARE IN EXCELLENT CONDITION! 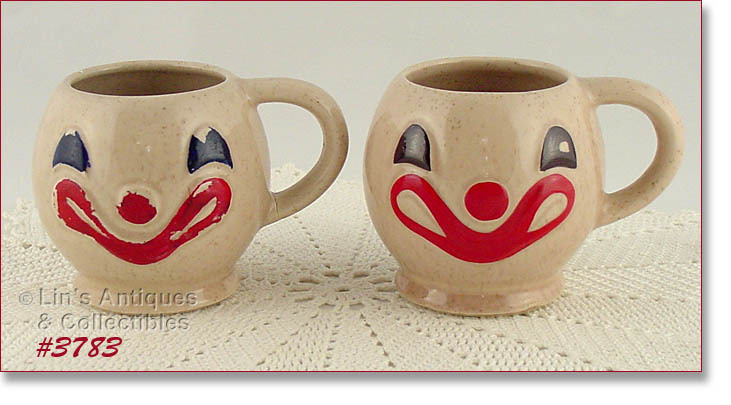 THIS LISTING HAS TWO MCCOY CLOWN FACE CUPS/MUGS! THEY ARE TAN COLOR WITH LOTS OF “SPECKLES” AND BOTTOMS ARE MARKED MCCOY, LANCASTER COLONY (MARK), USA. BOTH ARE IN SUPER CONDITION WITH NO CHIPS OR CRACKS. ONE HAS SOME PAINT LOSS (NOT UNCOMMON BECAUSE IT’S COLD PAINTED), THE OTHER HAS EXCELLENT PAINT. THE CLOWN MUGS ARE RATHER DIFFICULT TO FIND! THIS LISTING HAS 4 SNACK BOWLS FROM MCCOY’S WESTERN WEAR (WARE) LINE OF 1979! BOWLS MEASURE 2 ¼” TALL, 4 ¾” DIAMETER. THEY ARE IN EXCELLENT CONDITION. THE BOTTOM DRY RING OF ONE BOWL HAS BEEN SIGNED BY BILLIE MCCOY AND DATED JULY 2000. THESE BOWLS MATCH/COORDINATE WITH OUR SET OF 4 CUPS/MUGS LISTED AS OUR ITEM INVENTORY #1607 AND OUR PITCHER #198! PRODUCED IN 1942, THIS IS AN UNMARKED MCCOY 48 OUNCE ICE JUG / PITCHER! IT IS AN EARLY MCCOY PRODUCTION WITH FLAT, UNGLAZED BOTTOM. PITCHER IS IN SUPER CONDITION WITH NO “USE” EVIDENCE! IT HAS TYPICAL MCFLAWS – SOME DOTS IN THE GLAZE, PIN-POPS, ETC – NOTHING DETRIMENTAL. IF YOU COLLECT MCCOY EARLY ITEMS OR COLLECT STONEWARE PITCHERS, THIS WOULD BE AN EXCELLENT ADDITION TO A COLLECTION – IT’S SUPER NICE! 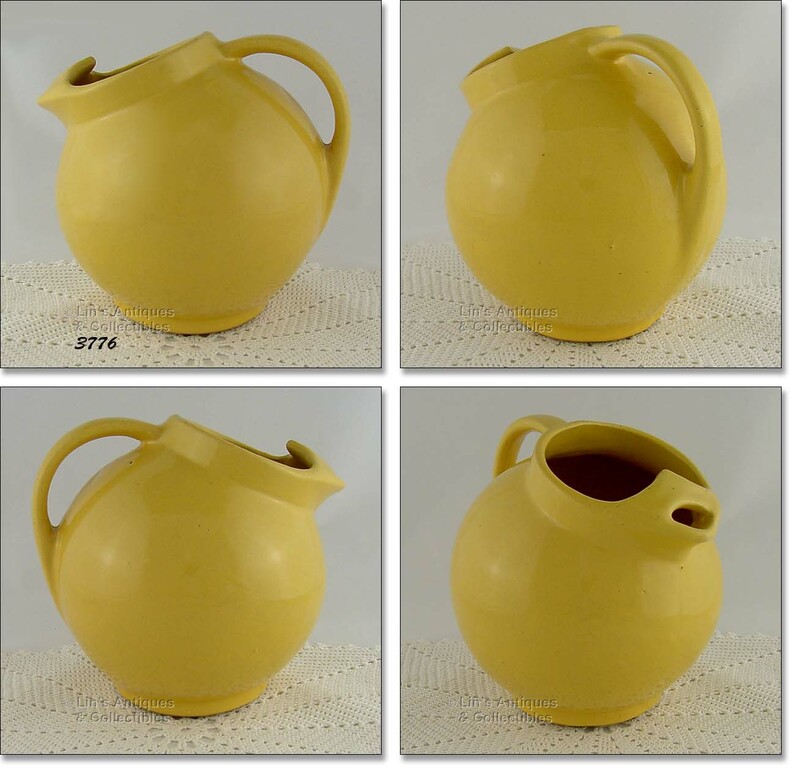 THIS LISTING HAS A MCCOY CREAMER FROM THE PRETTY “LOST GLAZE” LINE! BOTTOM IS MARKED MCCOY AND CREAMER IS IN EXCELLENT CONDITION. NEAT ITEM, SUPER COLLECTIBLE! EXCELLENT CONDITION MUG FROM MCCOY’S WESTERN WARE LINE OF 1979! THIS IS THE LARGER 4” TALL, 16 OUNCE SIZE AND BOTTOM IS MARKED 935, MCCOY, LANCASTER COLONY (MARK), USA. MUG IS THE AMBER/WARM HONEY COLOR WITH SHINY GLAZE. VERY PRETTY! WOW – WHAT A FIND – 4 MCCOY SOUP AND SANDWICH SETS! THERE ARE 4 SANDWICH PLATES WITH MATCHING CUPS/BOWLS. PLATES MEASURE 11” X 8 5/8”, CUPS ARE 3 ¾” DIAMETER, 2 ¾” TALL. ALL ARE MARKED MCCOY AND ARE IN EXCELLENT CONDITION! 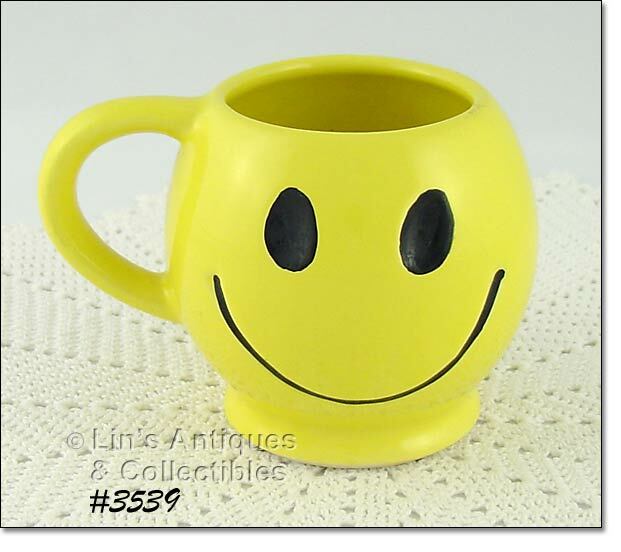 EXCELLENT CONDITION MCCOY SMILE (HAPPY) FACE MUG! BOTTOM IS MARKED MCCOY, USA (IN CIRCLE WITH LINES). MUG LOOKS NEW AND UNUSED! PRODUCED IN THE LATE 1970’S, THESE BABY DISHES ARE FROM MCCOY’S WABBIT COLLECTION! 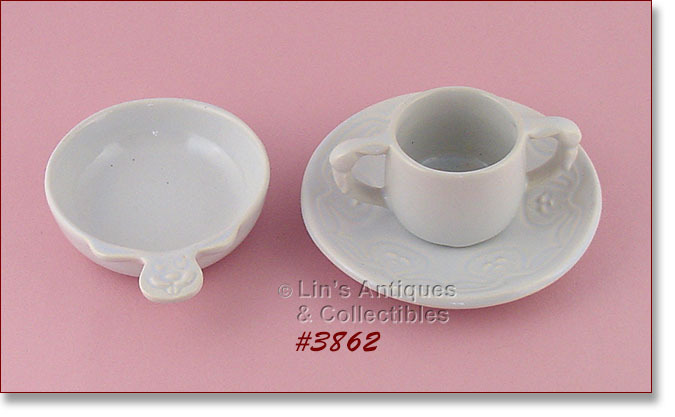 THERE ARE 3 PIECES IN THE SET: A TWO HANDLED CUP, A TAB HANDLE BOWL, AND A SAUCER. THE COLOR IS A BEAUTIFUL BLUE AND THEY ARE MARKED: 1221 (1222, 1223), MCCOY, LANCASTER COLONY (MARK), USA. THE ONLY EVIDENCE OF “USE” IS A 1/16” DING ON THE RIM EDGE OF THE BOWL – THAT’S IT! VERY NICE!! EXCELLENT CONDITION MCCOY FISH SHAPED PLATTER! THIS IS THE LARGER SIZE (18 ¼” X 8 ½”) AND IS A PRETTY WHITE COLOR WITH SHINY GLAZE. BOTTOM IS MARKED: OVEN PROOF, 9375, USA. SUPER ITEM! 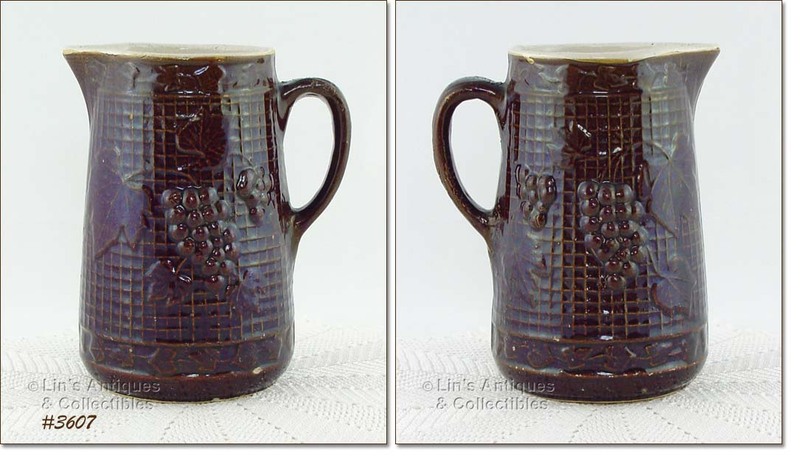 THIS LISTING HAS A VERY NICE UNMARKED MCCOY SANITARY STONEWARE COMPANY “GRAPE” PITCHER! PRODUCED IN THE LATE 1920’S, IT MEASURES 8 1/8” TALL AND IS IN SUPER CONDITION – HAS A FEW PIN-POPS, A ¼” SLICE TYPE CHIP AT LOWER BOTTOM, AND INTERIOR CRAZING – NOT BAD FOR ITS AGE AND UTILITARIAN USAGE. THIS PITCHER IS A GREAT ADDITION TO A MCCOY, STONEWARE, OR PITCHER COLLECTION! THIS LISTING HAS A 3 PIECE SET OF CHILDREN’S DISHES MADE BY MCCOY! PRODUCED IN THE LATE 1970’S, THESE DISHES ARE FROM THE “WABBIT COLLECTION”. THE COLOR IS ANTIQUE COLOR AND THE SET IS IN WONDERFUL CONDITION WITH THE ONLY “USE” EVIDENCE BEING A TEENY (1/8”) DING ON THE BOWLS TAB TYPE HANDLE – THAT’S IT! ALL PIECES ARE MARKED: 1221 (1222, 1223), MCCOY, LANCASTER COLONY (MARK), USA. NEAT COLLECTIBLES AND A WONDERFUL GIFT FOR BABY! VERY PRETTY MCCOY CEREAL BOWL! THIS ONE IS PINK, MEASURES 2 ¼” TALL, 5 ¾” DIAMETER, AND BOTTOM IS MARKED MCCOY, USA. BOWL HAS TYPICAL PRODUCTION COLOR DRIPS, PIN-POPS, ETC. IT HAS A PRODUCTION STRESS AT RIM THAT AS SUPERFICIAL HAIRLINE (LOOKS LIKE A CRAZE) – IT IS NOT DETRIMENTAL. NICE ITEM, PRETTY COLOR! 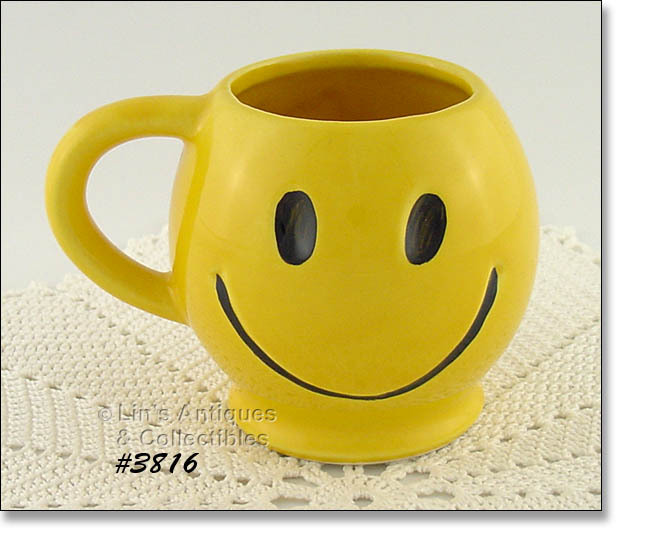 EXCELLENT CONDITION MCCOY SMILE FACE MUG! BOTTOM IS MARKED MCCOY (IN CIRCLE WITH LINES). MUG LOOKS NEW AND UNUSED – SUPER! THIS IS A NEAT MCCOY ITEM – A MUSTACHE MUG! IT MEASURES 5 ¼” TALL AND BOTTOM HAS MCCOY’S PITCHER MARK, USA. 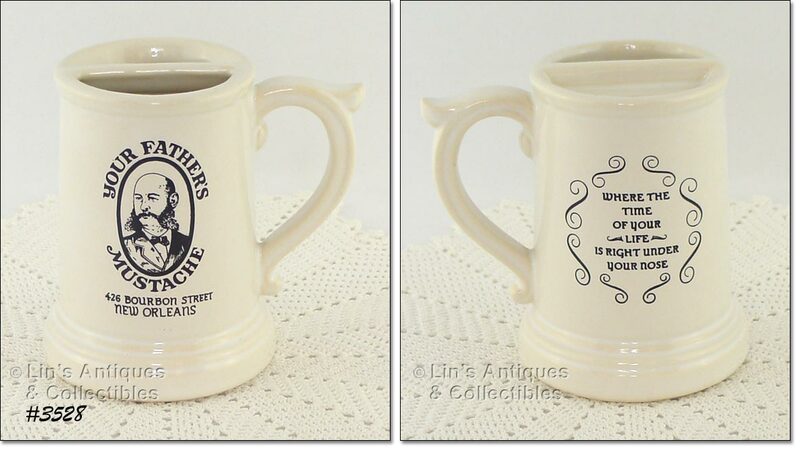 ADVERTISING STEIN IS FOR “YOUR FATHER’S MUSTACHE, 426 BOURBON STREET, NEW ORLEANS”. IT’S IN WONDERFUL CONDITION WITH ONLY “USE” EVIDENCE BEING A ½” GLAZE SLICE TYPE CHIP ON BOTTOM (UNDERNEATH) – THAT’S IT! 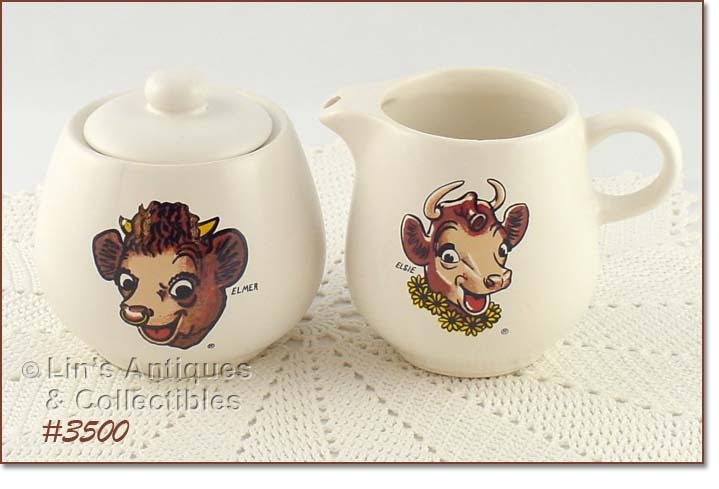 EXCELLENT CONDITION MCCOY CREAMER AND SUGAR – THE CREAMER HAS “ELSIE” THE COW AND THE SUGAR HAS “ELMER” THE BULL! BOTH ARE MARKED 7020, MCCOY, USA AND THEY APPEAR TO HAVE ALWAYS BEEN DISPLAY PIECES. SUPER!